Palpitations are feelings that your heart is skipping a beat, fluttering, or beating too hard or too fast. You may have these feelings in your chest, throat, or neck. They can occur during activity or even when you're sitting still or lying down. Although heart palpitations can be worrisome, they're usually harmless. In rare cases, heart palpitations can be a symptom of a more serious heart condition, such as an irregular heartbeat (arrhythmia), which may require treatment. Unless your doctor finds that you have a heart condition, heart palpitations seldom require treatment. Instead, your doctor may recommend ways for you to avoid the triggers that cause your palpitations. If your palpitations are caused by a condition, such as an arrhythmia, your treatment will focus on correcting the condition. 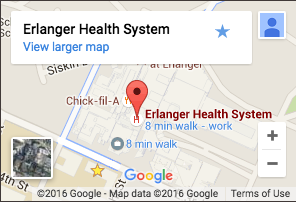 The electrophysiologists at Erlanger Cardiology are leaders - and international physician trainers - in the diagnosis and treatment of palpitation and other heart rhythm disorders (arrhythmias). Contact us to learn more.